While studying economics in Barcelona, I had the fortune of meeting an extraordinary young woman from India. Smart and ambitious, she was working to receive her master’s degree in Finance. We found ourselves fast friends, as we adapted to the Spanish culture. Although I considered myself up-to-date on the current events of the world, I soon realized that my education had not provided me with an adequate knowledge of her world. I pictured India as the mysterious land of the Taj Mahal – the home of a civilization which for so many years fascinated the western world. (As a music lover, I digress to note that India has even served as a fount of musical inspiration, as evidenced through Debiles’ opera Lakme.) I saw India as the home of freedom fighter Gandhi, call centers, Slumdog Millionaire, and astrophysicist Raj from the popular sitcom, The Big Bang Theory. Through the discussions with my friend, a very different picture of India began to form in my mind: an India with opportunities, destined to make a major impact on our world. However, my friend made sure not to give me a biased view of her country. Sharing her experience working as a computer programmer in Mumbai, she explained the inequalities that existed within India. She was baffled by how the super-rich were able to drive past starving people in their luxury sport cars, without feeling personal obligation to help those less fortunate. The India that my friend explained to me is an India of paradoxes. When I saw “In Spite of the Gods: The Rise of Modern India” by Edward Luce on the bookshelf after returning to the United States, I was instantly drawn to its cover: a man in a turban in a rural area talking on a cell phone. This one illustration portrayed the diverse India that my friend described: the India of rich and poor, of urban and rural, of opportunities for some and entrapment for others. On page 142, the author shares some interesting statistics regarding the Indian caste system, in particular that 74% do not agree with marriages between people of different castes. This is a belief that is shared by both the educated and non-educated alike, as 56% of graduates also disagree with marriages between castes. In contrast, I have been taught to see diversity among a population, and among a couple, as strength, rather than a weakness. What does diversity mean to your own community or country? If these statistics indeed show a lack of acceptance towards diversity, what does this mean for India? How has popular media affected religion? Why does it seemingly affect different religions in different ways? India’s is the world’s largest democracy, in that it encompasses the most people. Throughout my elementary and secondary education, I was inundated with information regarding democracy, from its roots in ancient Greece, to the writings of Locke and Rousseau. 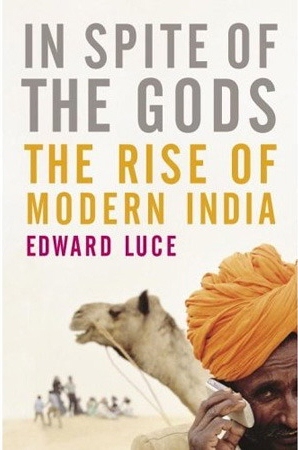 This book offers an interesting view of democracy, focusing on its practice in India. We can see political parties are heightened by regional and social differences. Instead of focusing on the good of the country as a whole, parties’ rhetoric often focuses on the perks it can obtain for a certain population. For those who have experienced Indian politics firsthand, how would you describe the state of democracy in your country? For those outside of India who have read this book, what can we learn from democracy in India? As an economics student, Nehru’s strategy for developing Indian industry (page 49) is extremely interesting. Following independence, India set to create an educated population, proficient in the English language. This capital intensive is in contrast to other models, in which the goal is to offer a large amount of labor and to offer it at an inexpensive price. What are the positives to Nehru’s vision? What are the negatives? Being a United States citizen and being open to answering people’s questions, I have been asked countless times while abroad about the attacks on 9/11. Although I sense many want to take this discussion into a political arena, I often respond by trying to explain the vulnerability that Americans felt at this time and the wave of patriotism which subsequently followed. My friend and I bonded over this point, as she explained the terrorist attacks in Mumbai and her own sense of unease of the future. I realized through this book how real this issue is to her. It appears that religious-based conflict is not outside of the norm. This book goes into the events of Gujarat, something of which I had never heard before. The Line of Control between India and Pakistan is also a constant reminder of conflict. To those living in India, how have these conflicts affected you?